I walked into my doctor’s office early in the morning, barely awake. The nurse behind the counter greeted me warmly. A pink sparkle on the desk caught my eye. I stared blankly, it took me a few seconds to recognize the pink energy beverage she was drinking. This is my least favorite part about being a FoodCorps service member – casually observing the eating habits of others. Whether in the grocery store or restaurant, I unconsciously take note of what others are eating. My spying does serve some purpose; understanding the rationale behind people’s food choices increases my impact. It helps me reach more children and families with effective programming. In my year (and some change) so far, I have come across many legitimate reasons people do not consume fruits and vegetables daily. Working to overturn all of these reasons and make healthy food more accessible is my charge. There are plenty of instances to hope. Last week, I transplanted vegetable starts with Mr. Ben Rausch’s seventh grade science classes. The district has a fabulous climate-controlled greenhouse complete with grow lights. Ms. Jessica O’Connor, high school ag teacher, started the vegetables for us: a variety of tomatoes, basil, and parsley! A few students were so excited to plant; they want to make tomato basil soup with our plants and grilled cheese sandwiches as a celebration (if they grow- fingers crossed)! 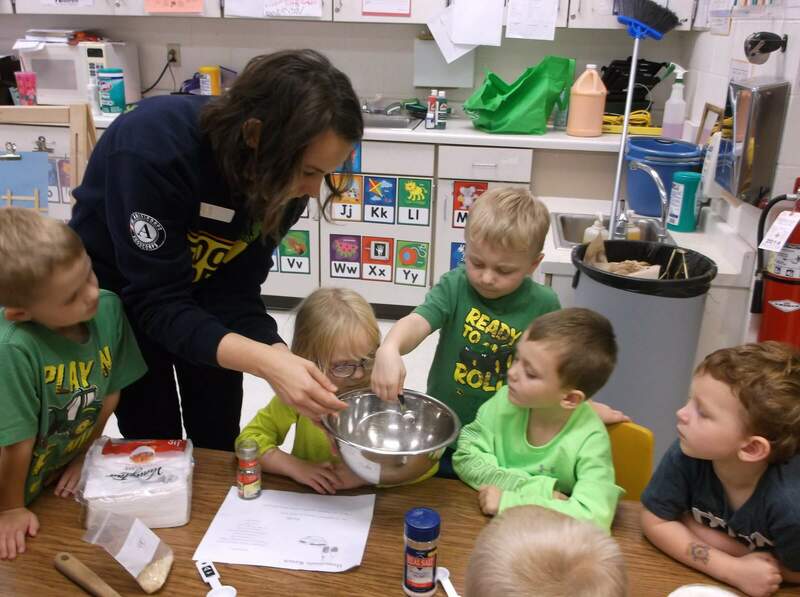 In Head Start and Bright Beginnings, we made homemade ranch dressing to try with raw broccoli. The students loved making the dip themselves, and some claimed they liked the spread better than bottled ranch! Working with students in these environments is a privilege. Through cooking and growing their own food, I have seen reluctant tasters turn into adventurous eaters. I want students to know food matters; what we put into our bodies has consequences for ourselves and the planet. Working to change the attitudes of children is never easy, but possible. It also doesn’t hurt that the homemade version of ranch is delicious and smells wonderful! In a bowl, mix 1 tablespoon dried minced onions, 2 teaspoons dried parsley flakes, 1 ½ teaspoons salt, ¼ teaspoon pepper, ¼ teaspoons garlic powder, 1 cup sour cream, and 1 cup Greek yogurt. Combine all ingredients thoroughly and delicious vegetable dipping will be yours! 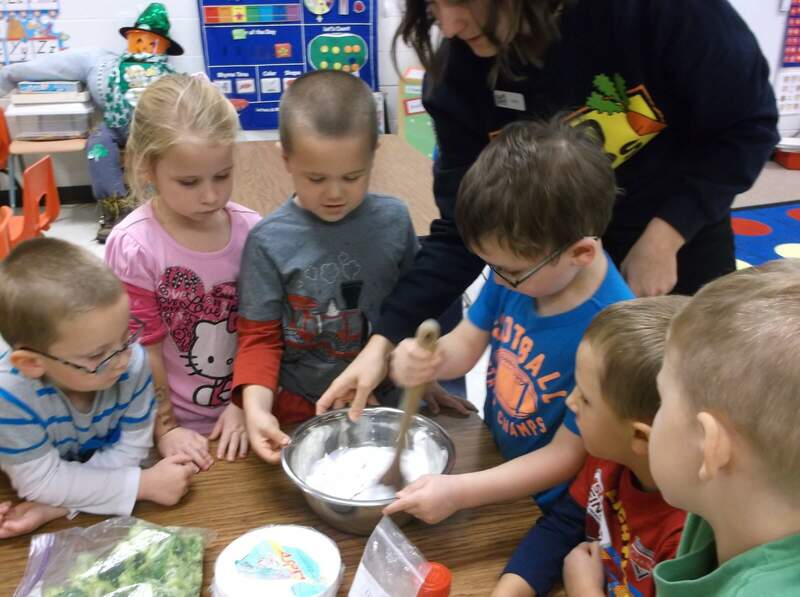 This entry was posted in Allamakee CSD, Early Childhood, School Wellness and tagged Recipe by Ashley Turk. Bookmark the permalink.